I’m not one for making new friends. I like to stick to the people I have known for a long time; friends from high school or college. Occasionally something forces me to change that, like joining a new church or workplace. Even then, most of the people there become work time acquaintances and not lifetime friends. Many years ago I was brought in as a partner to a company my high school friend, Ian started. We had a falling out a few years later and I left, only to return sometime after that as a contractor. Upon returning only one person was remaining from the old team that we had hired as a customer service rep., except now he was the manager and my boss. I didn’t get to know Jeremy too well before leaving the first time, but what I did know about him I liked immediately. He conducted himself in a way that even when he was mad he was completely calm on the outside. Some people can pretend to do this but then snap later, but not Jeremy. There was a peace about him that was magnetic. It was real. If he ever really got upset I think he would just laugh at himself. I can be an angry person. I developed into this as I got older so my attraction to Jeremy’s character was natural and inviting. He was a way I wish I was. When I returned I knew it was a good idea to have hired him with Ian many years before. Returning with Jeremy as managers was a welcome surprise. We didn’t spend too much time together outside of work, but we had good conversations in his office when the time called for it. We spend many nights board gaming and planning gaming events with friends. We both had a passion for military history, even though I wasn’t as knowledgeable as he was, I still enjoyed learning something each time we spoke. A couple years ago he told me about a passion he had to take that military knowledge and maybe teach. I told him about my ambition to do something more meaningful than helping sell luxury car parts that no one needs. It was our little secret as we pursued the possibilities of new vocations. Jeremy got involved at the Oshawa Tank Museum and eventually became their president. He had created a pay position there for himself that got approved by the museum board and he was gone at the end of the year. I had made the decision to leave Bimmian as well around the same time as Jeremy but would not actually exit for another 5 months. It’s a life change that I felt bonded us a bit. I was sad to see Jeremy leave while I would still be around for those few months, but I would smile when I thought of him doing what he loved. I felt he was greatly blessed to have this opportunity. Come to think of it, I felt like Red recollecting his friend Andy in Shawshank Redemption after he broke out of prison. In the following months I would have lunch and visit Jeremy from time to time. It was good for me to do so. I loved the guy and enjoyed how I felt around him. I still call text him from time to time sharing how I’m visiting a special historic location, and he tells me about a conference or some new piece of equipment they are getting at the museum. I will miss my friend Jeremy. I will also miss my friend Andrew. Turns out I made more that one good friend from my 3 years back at Bimmian. We had a habit of shuffling offices at Bimmian, sometimes to the point that we would lose a lunchroom to make space for a new employee. This happened a couple years back and Andrew, the Bimmian shipper now had to eat his lunch in my R&D area. One day I decided to join him. I think it surprised him at first since we barely spoke before this lunch, but after a few weeks of these lunches, conversation was easy and I think we both looked forward noon time. Andrew had a humble simplicity about him that I admired. Much like I admired Jeremy’s peace, I admired Andrews humility. You can hear it in his speech, see it in his car, house and dress. He is a good man that is content with life. He seemed genuinely happy. If one day he knows the Lord, I will rejoice with him because he is one of the good ones. Thats is another thing about Andrew; he is a terrific listener, even if the subject matter isn’t too comfortable or even possibly offensive. He listens to me jabber about issues of faith and shows me full respect, even though I may not show him his due all the time. (Jeremy also did the same). 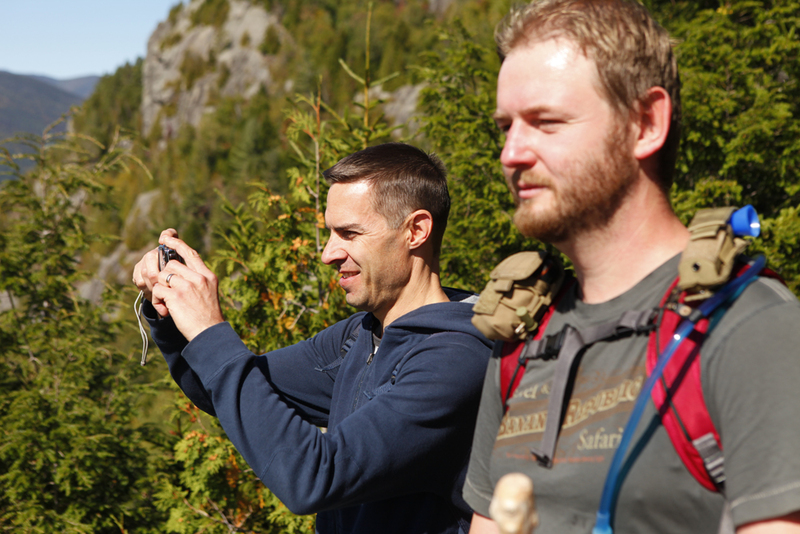 We took a road trip to the Adirondacks to do some hiking, biking and camping. It was a great time and I realized I could easily do this often with Andrew. It was a shame I would be leaving on this journey so soon. Spending time with Andrew and his wife Cheryl was something I thought about often enough to include them in some of the dinners we had with close friends and family in the months before departure. They were becoming like family member attending Christmas dinner and a special going-away meal. I think we would have been quite close had we not left. It was one friendship I was really hoping to develop further and it truly pained me to leave it as I did. Before I returned to Bimmian for 3 years, I had met Scott and Steve while doing some short term contract there. Steve and I would hang out after work to watch football a couple of times and for board gaming a few more. He was a brother in Christ that I really appreciated. He was soft at heart and had gone though some tough times in the last couple years. I hope he wasn’t too shaken by it and that he remembers where his strength comes from. I never really hung out with Scott outside of work but he was a comrade while on the clock. He understood many of the inside jokes I made about movies and music and was a passionate bassist and new father. I’m not sure if Scott was ever fulfilled at Bimmian. Like so many who have passes through there, it seemed to just be a convenience to him. He knew the job well but I always felt that he could so something more meaningful. That’s the tough part about learning about someones passions, you then realize they are being held back from truly pursing them. This was the same for Steve. I will miss Scott and Steve, and the antics of the whole Bimmian team, which in their own way, made my day a little brighter. Maybe that is why while being able to work from home whenever I wanted, I found myself coming in to work with these fine folks. 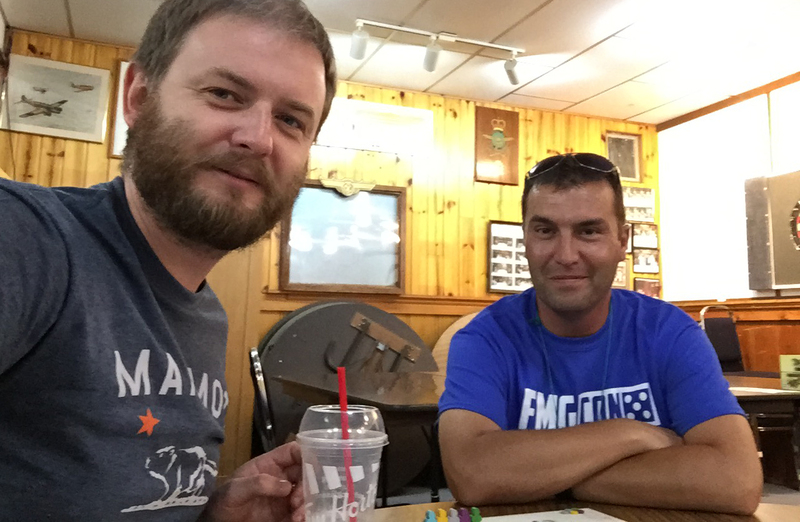 Jeremy and I board gaming at the Field Marshal Gaming Convention we partake in annually. Jeremy helped start this event and I was privileged to assist as a Marshal and Graphic Designer for the event since 2011. Andrew and I enjoying the Adirondack view from Mt. Giant. I hope we can have more adventures in the years to come.